No, I didn’t forget about these last two weeks of our creativity course at the library. Winter decided it was going to give us everything over the course of about 7 days. Yes, it’s been a steady diet of cold, snow (50+ cm in one day), freezing rain, sleet, a minor ice storm, power outages, and a bit of sunshine once or twice in there for good measure. You don’t want to be here right now, trust me. Oh, and look….tomorrow’s forecast is calling for more snow! So, let’s pop in a little green to spruce things up. 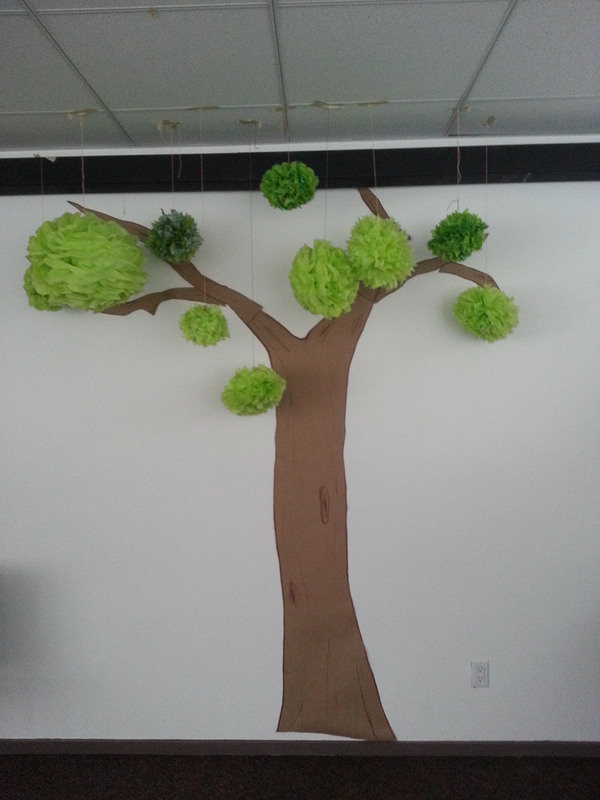 I made this fun wall-sized tree with green tissue paper pom poms to bring a little spring inside when everything has been feeling soooo wintery! It was a lot of fun, and even the kids at the library had a blast standing under it. During Week #5, which was all about “Recovering A Sense of Possibility”, we talked about so many things, like limits and rules that we set for ourselves. I’ve always been a rule-maker for myself, and this chapter really hit home. Trying to free myself from that will be a challenge, but now that I know it’s something I’ve done, and not something that is, I think I can make some changes. Everyone in the group had some sort of common story that was all about limits they’d put on themselves, so it was good to feel like we weren’t alone. Week #6–and this is our last session for now—is about “Recovering a Sense of Abundance”, which is essentially thinking about money in different ways, not letting it become a source of stress, and allowing ourselves “luxury” wherever we can find it. I loved the ideas behind week 6, and I think this is something that can carry over into many parts of our lives, not just when thinking about creativity. The group had LOTS to say about this topic, and I hope they will follow through with the exercises. Since we decided to run this only as a six-week course (because really, I had no idea how people would react to it….and who wants 12 weeks of boring, right? ), this was our last session for a while. And that makes me sad, which is a TOTAL surprise to me. I was mystified by this whole thing, and really had trouble figuring out who was getting anything out of it, and if so, what. But our last session really opened my eyes. I had everyone fill out a program quiz, to see what worked and what didn’t, and I was shocked. We also had a great discussion during the last session, and I discovered SO much! Like…. More people wanted bigger creativity activities each week. They liked making things! Everyone said they came to the sessions to become inspired again…and to make friends. Several people in the group have been following up with each other, meeting for coffee, and emailing. Wow! One woman told us at the last session that she had always felt like an alien from another planet. But the minute she walked into our group, she felt like she belonged for the first time ever. Wow. That was powerful. One member told us the course had completely changed her life. Her focus had been one way, but after doing all of the exercises, she realized her interests were in another direction altogether. And she has started to change her actions and goals, by auditioning for a voice over job, amongst other things! A wonderful lady who had facilitated group sessions in this course several times, said she was awakened by several ideas presented, and as a result, had gone out to pursue a new phase to her life by applying for a different job, and developing an idea for a course she’d like to offer. Amazing! I received a gorgeous email from one attendee who said while she had done this course several times on her own, the group dynamic totally changed it for her, and she was able to break free from some stressful parts of her life, and did something terrifying to her–but also exciting. We can’t wait to see what comes of it! There were so many breakthroughs….and even I felt a rush of clear thought, dynamic creativity, and exaltation at doing things that weren’t rushed…..that I know we’ll run the second part of this in the fall. I’m hoping to get the same group back for more, and it will be great to hear where they’ve gone with their ideas. I’d also like to run this same 6-week course again with a new group, using some of the ideas I’ve learned from this one. I think it’s something people are interested in, and it is wonderful to see people get excited about creating again. Wow. Six weeks seemed like such a long time, but it went so fast…. Now, time to get down to some serious work on a new book. Look out world….I’ve got big plans!